Social Security is so complex that a cottage industry has emerged to help figure out when to claim Social Security. Software companies sell their Social Security optimization tools to financial advisors for several hundred dollars a year. Guess where the money ultimately comes from? The end customers of course. If when and how to claim Social Security is all you want to know, you don’t have to go through a financial advisor. You can buy a book for $10 and learn yourself. Or you can try one of the online calculators. Before you use any online calculator, you should first figure out what your benefits are at full retirement age. Social Security Administration offers an online calculator, where you enter your earnings history for each year. You get those from the paper benefits statements you used to receive or by creating an online account with Social Security Administration. The displayed result is the early retirement benefit at age 62. You will have to gross up to the full retirement age. First look up your reduction factor. Then divide your early retirement benefit by 1 minus the reduction factor. If you are married, do it for each person. With this number in hand, you are ready for the claiming strategy calculators. AARP offers a Social Security Calculator online. It’s free. You enter whether you are single, married, or divorced, your birth date(s), and your estimated benefits at full retirement age. Then it tells you how and when you should claim. For a hypothetical couple, it said one of them file and suspend until age 70 and let the other claim the spousal benefits for three years. As far as I can tell, the AARP calculator doesn’t take into account any children’s benefits or the contingency when one spouse dies first. It also doesn’t include the survivor’s benefit for someone already widowed. Mutual fund company T. Rowe Price offers a Social Security Benefits Evaluator. It’s also free. You don’t have to be a T. Rowe Price customer to use it. 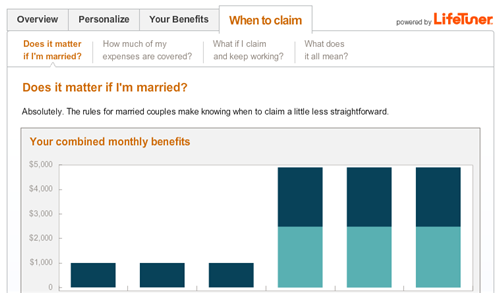 This tool lets you choose your own goal, such as to maximize benefits over both life times or to minimize the drop in income for the surviving spouse. However, it can’t handle a married couple with age difference of more than six years. It takes into account the survivor benefit after one dies. You can swap the life expectancy and model which spouse dies first. It doesn’t take into account children’s benefits. It can’t handle survivor’s benefits for a widow or widower or benefits based on an ex-spouse’s earnings history. For the same hypothetical couple, the T. Rowe Price tool identified the same strategy as AARP’s when I chose the goal as maximizing total benefits over both lifetimes. 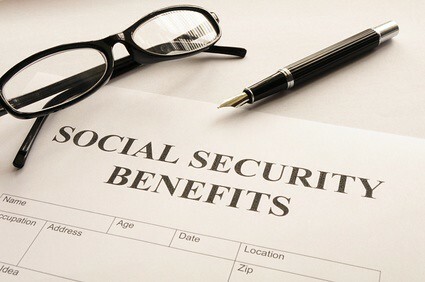 Social Security Solutions is set up by William Meyer and Baylor University Professor William Reichenstein, who wrote professional journal articles and the book Social Security Strategies. This is a paid service. It costs $20 for the recommendation and a report, or $50 for more analysis and interactive tools. If that’s not enough, you can pay $125 or $250 to have a session with an expert. I’ve never used it but I read good feedback about this service. If your situation is out of the ordinary or you want to be absolutely sure, the one-time cost isn’t that high. Maximize My Social Security is another paid service set up by Boston University Professor Larry Kotlikoff who frequently writes about Social Security. It costs $40 to use the online tool for 12 months. Maximize My Social Security describes what it does with a video demo, a sample report, and a detailed document. $40 is a reasonable price if you have situations not covered by a free tool, such as ex-spouse(s), survivor’s benefits, benefits reduction due to WEP or GPO, etc. Between free calculators and relatively inexpensive online tools, you will be able to figure out when and how to claim your Social Security benefits. The problem with these calculators for someone like me (who can start taking Social Security in 2036, when the trust fund is supposed to be depleted (2033 and beyond) when benefits will decline from 100% in 2032, to ~77% in 2033 and then eventually down to ~72% if congress does nothing (and they are very good at that). For those of us with longer time horizons until retirement, dependence on Social Security as an open and unresolved question. Right now I am planning my retirement as if it won’t be around. I agree there’s not much point in figuring out at the tactical level when you are more than 20 years away and so many things can change. The calculators are for those who are already close to being eligible. Even if no funding enhancements are made projections I have seen indicate Social Security will be able to pay about 75% of scheduled benefits indefinitely. That is what I’m using for my most conservative planning . The kind of scenarios that would lead to no social secuirty are the kind of scenarios that would also have me stock piling cans of food and the means to defend it ;). @Furwut not quite…..there are scenarios where they could see if you have a certain asset/income level your payments would be reduced (or eliminated) so that they could increase benefits for those under a certain income/asset level. There are people who have already proposed that (no serious proposals, though). So there are scenarios other then the complete collapse of the government in that you (or I) may not get any social security. Anyone that tells you they know what is going to happen is fibbing (or deluded!). That is the reason I don’t include it in my calculations, there is a large amount of uncertainty (and my time horizon is long). Perhaps as I get closer to retirement it will be figured out, but I honestly doubt it. Means testing would be a radical departure (though that door was cracked open when they started taxing benefits) but, as you say, who knows what the future holds. Better to be the pessimist and be pleasantly surprised then the reverse. TFB – doesn’t the AnyPIA calculator provided but Social Security allow one to change the retirement date to any age between 62 and 70? Furthermore can’t one also calculate the benefit for an early retirement – before age 62 – by entering 0 as the earnings for future years? I installed AnyPIA on my computer. It’s quite clunky and confusing. Yes you can change the claiming date and recalculate. I find it much easier to just use the SSA online calculator together with the reduction factor. I don’t quite understand your second point. The SSA online calculator allows you to enter your estimated future earnings, and the age you plan to stop working. Your earnings after that age would be zero. If that age is before 62, it gives you the benefit at 62. Then you need to back into your PIA using the reduction factor. Note: This calculator will accept a stop-work age up to 85. If the age you enter is less than 62, we estimate your benefit at age 62. If the age you enter is at least 62, we use that age when we estimate your benefit. So if one is planning on retiring early, say age 55, but not collecting their benefit until age 70 couldn’t one enter the actual earnings up to 55, enter 0 for future earnings, and change the age are retirement box to 70? Wouldn’t that give them an accurate benefit calculation without having to apply a reduction factor? If you are currently 50 and you plan to retire at 55, you enter 55 as the age you will stop and your estimated annual earnings between 50 and 55 as earnings in 2015 and later. Then you get the benefits at 62. If you enter age 70 as the age you will stop and zero as earnings in 2015 and later there’s no place to account for your earnings between 50 and 55. If you shift the calendar years for your past and estimated future earnings, the indexing factors would be all wrong. Yes – I agree. I was focused on the special case when you are within a year or 2 stopping work. If they changed the website so that when your entered your stop age + age to collect it generated entry fields for future earnings – pre filled with your last actual but which you could change – I think it would do the trick for everybody. My wife and I recently used Jim Blankenship’s service to estimate or benefits and strategize when and how we should begin taking social security. We are married, in our mid 50’s and are 2 years apart in age. After giving Jim our social security statements he was able to give us report with 6 possible scenarios that included cash flow summaries and benefit summaries across the scenarios. He also spoke with us on the phone to explain the report and to answer all our questions. Did the two free calculators in this article offer you the same optimal strategy as the software Jim used? I’m more interested in the recommended strategy than the actual numbers. If you follow the same strategy, you will eventually get the same numbers from the Social Security Administration. – If you delay taking your SS benefits, how long do you need to live to first break even, and then reap the reward? Yes they all do file-and-suspend. The first two are free. Try them.